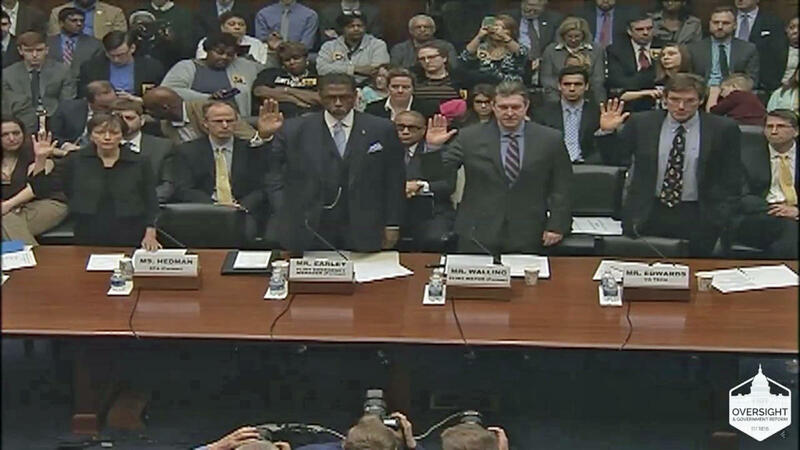 Panelists (l to r) Susan Hedman, Darnell Earley, Dayne Walling, and Marc Edwards are sworn in before testifying to U.S. House Committee. A U.S. House committee held a second hearing on the Flint water crisis Tuesday, taking testimony from some key players in that disaster. Former Flint emergency manager Darnell Earley, former mayor Dayne Walling, former EPA official Susan Hedman, and Virginia Tech engineering professor Marc Edwards – whose independent research team helped reveal the high levels of lead in Flint water late last year – all testified. But the hearing was defined largely by blistering criticism leveled at the U.S. EPA for failing to step in sooner. Committee members questioned how the EPA failed to intervene or expose the lead-in-water crisis for months – even after it knew state regulators weren’t making Flint treat the water properly, in violation of federal law; and one of its own scientists, drinking water expert Miguel Del Toral wrote a memo expressing serious concerns about the situation. But Hedman, former head of the EPA Region 5 office, came in for the harshest criticism. "You were in charge. Did anybody at the EPA do anything wrong?” committee chair Jason Chaffetz, R-Utah, asked Hedman at one point. Earley also faced some pointed questioning. He was the emergency manager in Flint when the city switched to pumping water from the Flint River in 2014, though he took pains to point out that decision was made by a prior emergency manager. Earley blamed the crisis on the EPA and MDEQ, saying they gave him and other leaders false assurances that the water was safe. “This is a water treatment issue. This is not a leadership issue,” Earley said. Walling said he was similarly misled, and expressed remorse about his role. While the three-plus hour hearing mostly rehashed previously known facts about the crisis and sought to assign blame, a couple new details did emerge. One came in the form of emails obtained by the committee from Miguel Del Toral, the EPA expert who first raised the alarm about possible widespread lead contamination in Flint. Those emails show Del Toral felt he was being punished for releasing that memo to a Flint resident, Lee-Anne Walters, after he found extremely high lead levels in her home’s water in February 2015. Walters later gave the memo to the Michigan ACLU. As months went by without EPA action, Del Toral expressed increasing frustration with the agency’s lack of action, and said it seemed like EPA officials cared more about “trying to maintain state/local relationships than we do trying to protect the children” in Flint. Chaffetz also quoted a July email where Del Toral said he felt retaliation from EPA higher-ups for releasing the memo. “It almost sounds like I’m stuck in a corner holding up a potted plant because of Flint,” Del Toral wrote, saying he was required to go to ethics training. Hedman, however, denied that Del Toral had suffered any disciplinary action or retaliation to her knowledge. The committee’s ranking Democrat, Elijah Cummings of Maryland, also noted that Congressional investigators had met with a notable lack of cooperation from some Michigan officials. Cummings said committee staff had interviewed now-former MDEQ director Dan Wyant, calling him “a difficult witness who evaded many of our questions." Wyant resigned in December, after Gov. 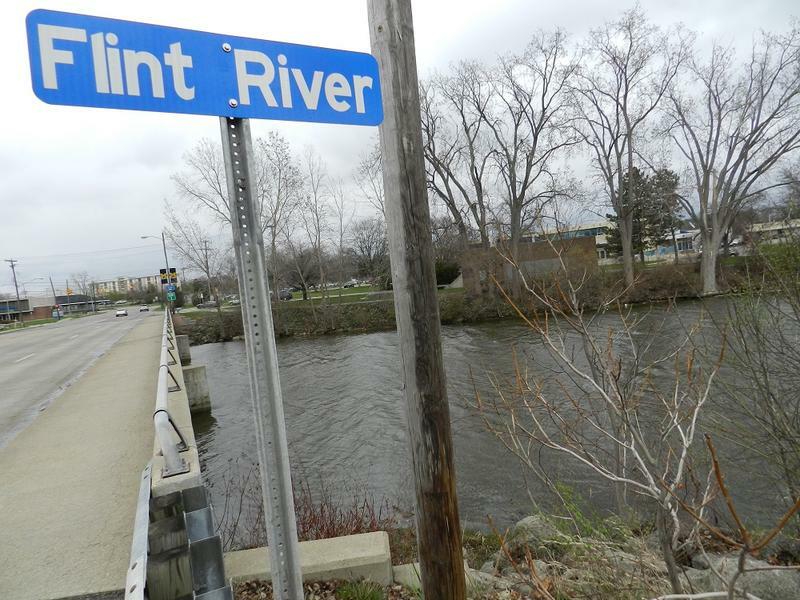 Snyder’s Flint water task force laid blame for the crisis squarely on the MDEQ. “He was not remorseful or apologetic in his interview with our committee,” Cummings said. But Cummings said Wyant did share an “interesting fact” – that in all his time as director, the topic of Flint water was never raised in any cabinet meeting. Gov. Snyder is scheduled to testify in another hearing later this week, alongside current EPA administrator Gina McCarthy. Some high-level decision-makers behind the Flint water crisis will answer to Congress this week. The House Oversight and Government Reform committee has hearings scheduled on Tuesday and Thursday. People in Flint say they have questions they want answered at this week’s congressional hearings into the city’s water crisis. Starting Tuesday, former emergency manager Darnell Earley, former Flint Mayor Dayne Walling and Gov. Rick Snyder are scheduled to testify before the U.S. House Oversight and Government Reform committee. Current and former officials with the Environmental Protection Agency are also scheduled to appear before the committee. Flint Mayor Karen Weaver says she has a list of questions. The state Legislature will kick off hearings on the Flint water crisis next week. 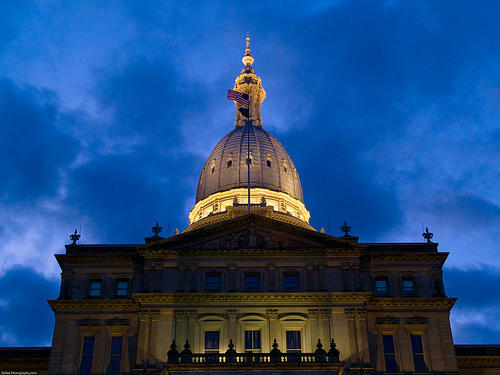 The first hearing on Tuesday morning will focus on a report from the Michigan auditor general that looked into decisions that led to the crisis. Republican state Sen. Jim Stamas, R-Midland, is the chair of the joint legislative committee.